Proverbs 31 Woman: How to Dehydrate Just About Any Food - Easily! How to Dehydrate Just About Any Food - Easily! Recently, I've received a few questions about dehydrating food: "How do you dehydrate such-and-such?" and "What dehydrating books do you recommend?" I was all set to send these reply with the easy way to dehydrate just about anything when I realized...I've never written such a post! How can that be? 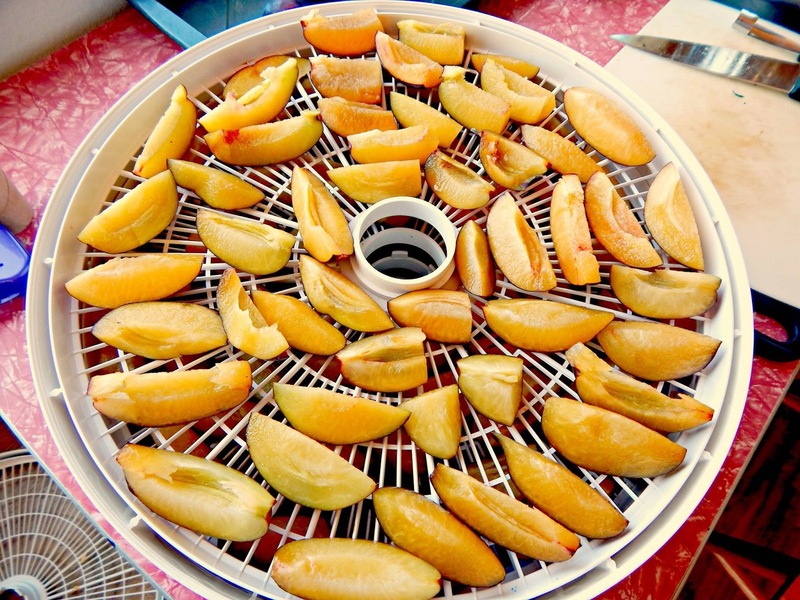 I've been dehydrating since my children were toddlers and I experimented with using my oven's warming drawer to dehydrate apple slices. It's an invaluable way to preserve food, whether I'm squirreling away orchard fruit for the winter or I'm trying not to waste store bought food that will soon spoil. In fact, dehydrating is just about the easiest method of preservation, with very little hands-on time required and little monetary investment necessary. 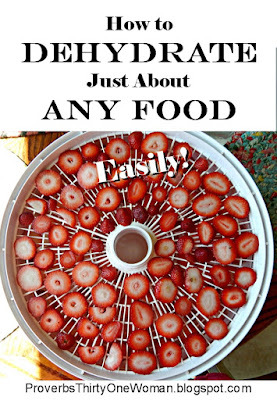 And here's the deal: Dehydrating is so simple, there's really no need for a book on how to do it. Once you know the basic rules about dehydrating, there's not even any need to hop online to check how to dehydrate a specific food. So let this post be your dehydrating "bible," if you will. Dehydrating with an electric dehydrator is really simple. And dehydrating other ways isn't hard, either. What Foods Can Be Safely Dehydrated? Fatty meats and dairy - All these tend to go rancid quickly because of their high fat content. A neat trick some people like to use is to dehydrate small drops of yogurt to use as snacks. This is fine - but those yogurt drops need refrigerating afterward. And yes, you can dehydrate lean meats without making them into jerky, but they aren't considered safe to store at room temperature. Eggs - Considered by most experts unsafe to dehydrate due to salmonella (which is not killed during the dehydration process). I have dehydrated backyard fresh eggs before, but I can't recommend them from either a safety or a quality standpoint. Nuts - You can dry these, but because they are fatty, their shelf life still isn't long. It's best to preserve nuts by freezing them. Fish - You can dehydrate fish but it will only last 1-2 months. It depends upon the food, how dry you get it, and how well you store it, but generally speaking, home dehydrated foods last about a year. * An adjustable thermostat, from 85 to 160 degrees F.
* An enclosed heating element and a fan/blower. The heating element should not be at the base of the unit, because foods could drip onto it. * UL seal of approval. * The ability to add trays. Other options include using a standard oven or using the warming drawer in an oven. Neither are ideal because very low temperatures cannot be achieved, which results in quality loss. Of the two, warming drawers are preferable. 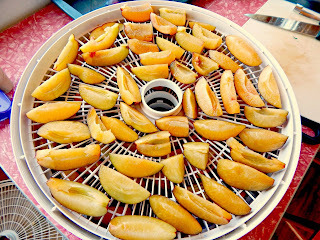 For more on choosing a dehydrator, click here. 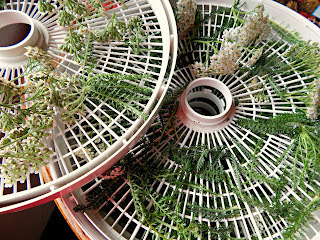 Herbs - 95 degrees F.
Seeds and Nuts - 105 degrees F.
Fruits - 135 degrees F.
Fruit leather - 140 degrees F.
Vegetables - 135 degrees F.
Jerky - 160 degrees F.
Herbs - For small-leaved herbs, place stems with leaves still on them onto dehydrator trays. 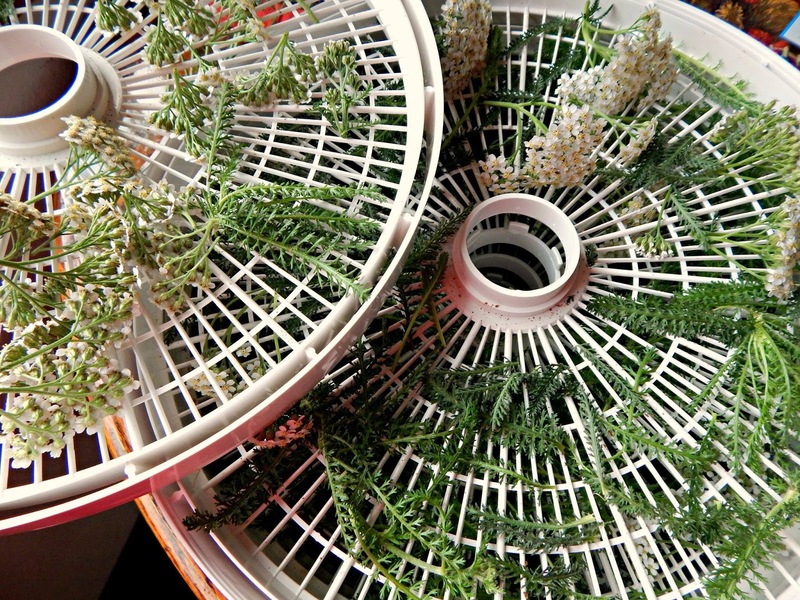 For herbs with large leaves, remove the leaves from the stems and place in a single layer on dehydrator trays. Dry until crisp. Leaves dried on the stem are easily removed by running your fingers down the length of the stem, with a bowl beneath to catch the leaves as they fall. Dehydrate until you can tear a piece of fruit and no fluid seeps out. Fruit should still be pliable after being dehydrated. To prevent over-drying, test a thinner or smaller piece of fruit before you think it's dry. Allow it to cool and test for doneness. A few fruits require an extra step; for example, berries with tough skins (like blueberries and cranberries), as well as grapes, need their skins broken before being dehydrated. An easy way to accomplish this is to freeze them in a single layer on a rimmed baking sheet. 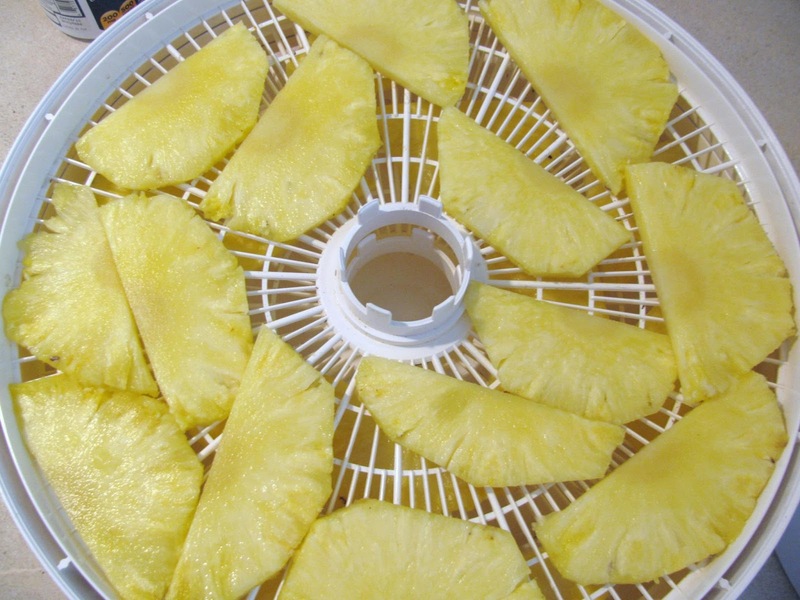 Once hard, transfer the fruit to the trays of a food dehydrator. Another method is to plunge the berries into boiling water for about 15-30 seconds, until their skins crack, then plunge into cold water to stop the cooking process. You may also prick berry skins with a needle or similar implement. Fruit Leathers - Fruit leathers are homemade fruit rolls. Puree fruit and, to prevent discoloration, stir in 1 teaspoons of lemon juice for each cup of puree. 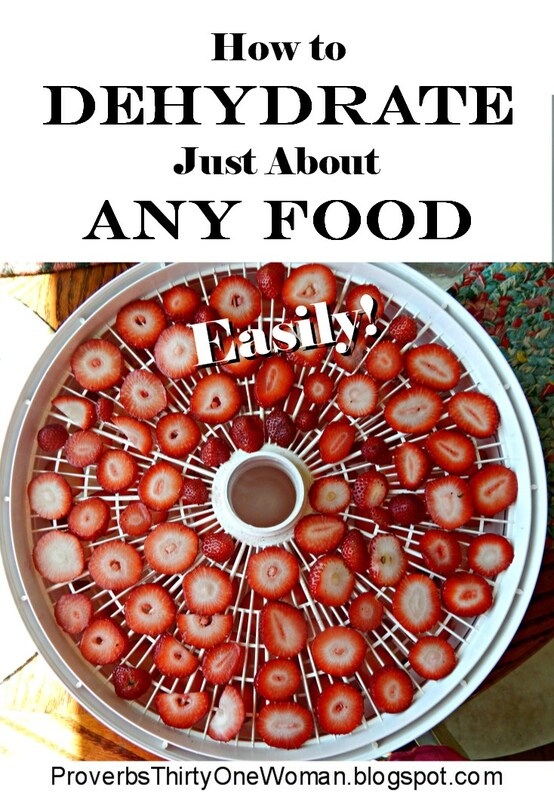 Pour into a fruit leather dehydrator tray and dehydrate. Leather is done when you can touch the center and see no indentation is left behind. Remove the leather while still warm, roll into a scroll, allow to cool, and wrap in plastic wrap. Freeze, if not using immediately. Vegetables - Cut, if desired, and dehydrate until you can tear a piece and no liquid seeps out. Veggies should be brittle when dehydrated. Most vegetables require blanching (drop into boiling water for 2 - 3 minutes, then dunk into ice water to stop the cooking process) to help preserve color, flavor, and nutrients. 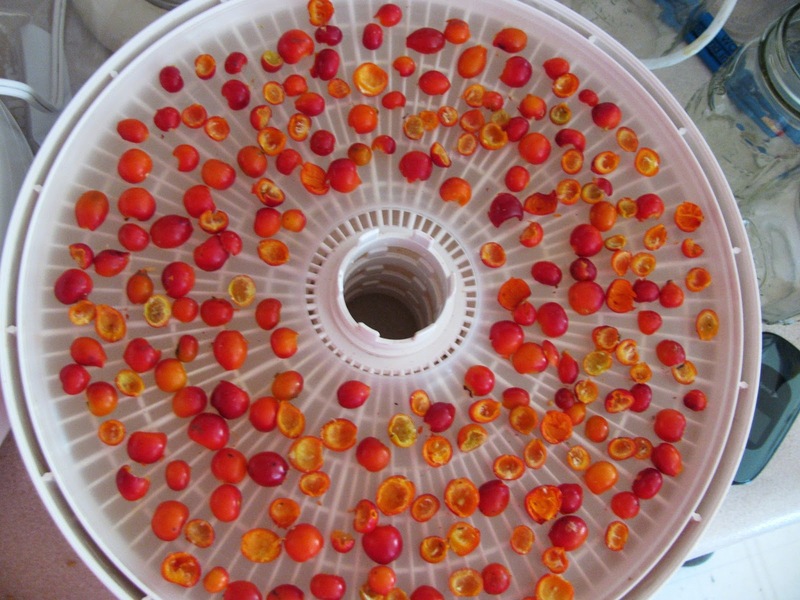 Many times, I leave off the blanching and just pop the veggie into the dehydrator; it's a matter of personal preference. The following veggies should never be blanched before drying: cucumber, eggplant, garlic, horseradish, mushrooms, onions, peppers, and winter and summer squash (including zucchini). Jerky - Cut all fat off the meat and season as desired. 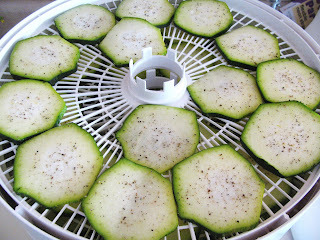 Lay in a single layer on the dehydrator tray and dry until the meat cracks when you bend it. Homemade jerky should be stored in the refrigerator or freezer. For information on using a jerky gun, click here. For info on making smoked jerky, click here. IMPORTANT: Food should not touch on the dehydrator trays, or the pieces may stick together. Always check the food every few hours during the dehydration process. This ensures you don't over-dry anything. (Yes, you can over dry dehydrated food, making it tasteless and too tough.) Remove finished pieces as they are done, consolidating pieces that still need drying time. In addition, be sure to rotate dehydrator trays periodically. Experts suggest "conditioning" your home dehydrated food before storing it long term. I honestly never do this and have never had a problem - but it does allow you to spot food that still has moisture in it. 1. Allow the food to cool completely. 2. Place the dried food in a plastic or glass container with a loose-fitting cover. 3. Shake or stir the food every day for one or two weeks, looking for any signs of moisture. 4. 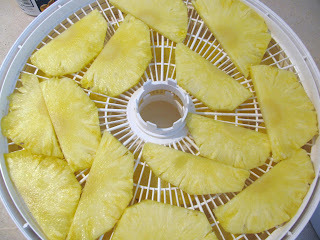 If you find moisture, put the food back in the dehydrator, dry and allow to cool. 5. Once you're sure the food is dry, store in a glass jar with an air tight lid, a Ziplock bag with the air pushed out of it, or in a vacuum sealed bag. Store the container in a cool, dark environment. Be sure to label the food, including the date of preservation.